It's March - another month closer to Christmas! Have you finished your Christmas cards yet? Me neither, but here's one to add to the slow-growing pile. My card is a collection of scraps and leftover diecuts. The house is from Houses, the trees from Houses Extras and the hill is from Stitched Snow Hills. I added some Stickles to the house, trees and hill and a sentiment (from Christmas Elf). 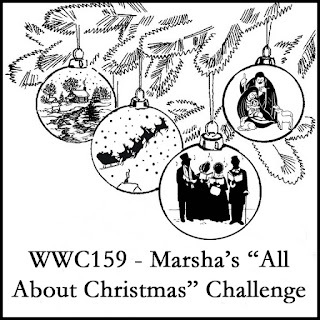 I'm also playing along with Simon Says Wednesday Challenge - Anything Goes. Gah! I'm actually very far behind on my Church Christmas card project - 300 needed, 0 made. Time to get started! I love your take on the inspiration - a great use of your scraps to make something beautiful! Thanks for joining us at MCV! Fun and fabuofabulous and such a super Christmas card! You becoming a regular here!!!! I love it! Awesome take on Lindsey's card! Thanks for playing again! 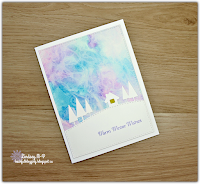 I love the background you've created for your card! A great take on the inspiration card. Thanks so much for joining us at Watercooler Wednesday Challenge this week! What a lovely card you've created out of scraps and left-over die-cuts. From that wonderful background to the die-cuts and houses, this card just rocks! Love the colours you've chosen, too. Thanks so much for joining our Watercooler Wednesday Challenge this week. great case mf...you made it so uniquely yours which I love. I love this! And that you were able to pull it together out of leftover bits makes it even more impressive. What a terrific wintery scene you've created with these scraps Shirley. especially the vivid colouring on the sky. Makes me feel the wind and cold just looking at it. Beautifully done. 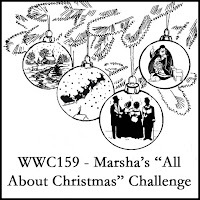 Thanks for sharing at the Watercooler Wednesday All About Christmas Challenge this week. loving this non traditional holiday card! thank you for playing along with us at simon says stamp wednesday challenge!